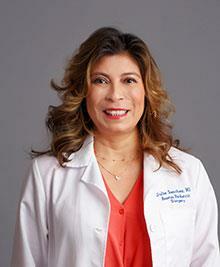 Dr. Sanchez and her family have lived in Austin since 2001. In addition to a successful surgical practice, she is a co-founder of Abilitee Adaptive Wear, an online clothing company for children and adults with special needs. She also has a passion for education, global health and injury prevention. My initial passion was architecture. As an undergraduate at UT-Austin, my father encouraged me to think about medicine. I became a volunteer at Brackenridge Hospital. That's were I discovered my passion for medicine. Pediatric surgery allows me to care for children, empower parents and be a mentor. I enjoy meeting parents, caring for their newborn and seeing their child grow into a young adult. I'm blessed to be part of the journey. My focus is to provide expert diagnosis and surgical treatment of a variety of general surgical conditions for children of all ages. My scope of practice ranges from perinatal consultations and hernia repairs to complex surgical management of tumors, birth defects and traumas.